This is a great update to a very gig-ready unit. It makes us wish we had some gigs lined up so we could try it! A refresh to the classic APC40 design - it looks sleeker and more functional, with a reorganised layout. Now has RGB LEDs - it will show your clip colours! Akai's APC40 was there at the beginning, as one of the first dedicated Ableton Live controllers, but the scene's evolved since then. The big players like Novation, and Akai themselves, have been through some changes since 2009 - Live itself has moved on, the iPad has risen as a serious control option, and of course, there's Push. Push is also built by Akai, but it obviously sees that as one possible solution, rather than an everything-killer, because it's just updated and expanded the APC range, rather than cancelling it. "The APC40 works for the performer, somebody who is more focused on control and clip launching"
The updates to the APC40 are arguably more cosmetic than functional - or that's how it seems at first. It mostly looks like it offers the same level of control as before, but that's not a bad thing because it was working pretty well! This is a low-profile, stealthy, redesign, with the black casing offsetting the lights nicely. It's also more boxy, minus those funny end cheeks which we wanted to saw off (and some of us did). The control surface has been reorganised in key areas - the device control knobs stay put, but the pan/send knobs are relocated above the grid of clip launch buttons, in line above the track faders. The crossfader's still present, although you can no longer replace it via the removable back panel found on the original APC. USB power is obviously enough for this one - there's no mains power option any more. We don't think we ever had cause to use that anyway. The package includes a USB cable, and a registration card for the software bundle, which includes Ableton Live Lite, 5GB of loop content, and the Hybrid and Twist soft synths; all of the range has roughly the same extras. We're also happy to report that they all use proper, full-size USB connections. Also present are a footswitch jack, and a Kensington lock slot (the new APCs all have this slot). In place for each track is a stop button, as before, a track selection button, and dedicated buttons for mute, solo, crossfader assignment, and record arming. It's great to have all of these available without resorting to function or Shift buttons - this makes a difference, especially in the heat (and low light) of performance situations. The biggest change, though, is with the pads; the APC still has 40 pads in a 5x8 grid (barely enough to be worth having, in my opinion), but they've evolved from small dull grey squares to colourful rectangles - instead of the amber/green/red colour array, still found on the other APCs, the Mk II has a full RGB colour range, so for the first time on an APC you can see your clip colours laid out before you. This makes a massive difference to usability, and adds eye candy points as well! 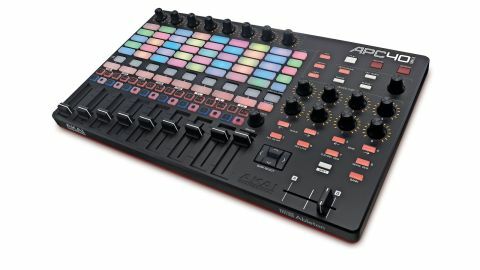 With the extra colours, and the new buttons, this incarnation of the APC40 is more Vegas and EDM than the earlier model. Pad quality and feel aren't really considerations on something like this. These aren't velocity or pressure responsive; you won't be using them to tap in drum beats. The original APC40 was showing its age in some ways, so an update isn't too much of a surprise, and it was launched long enough ago that nobody who bought the original should feel like they have a complaint.